His hair is soft and smooth and beautiful. He’s healthy! 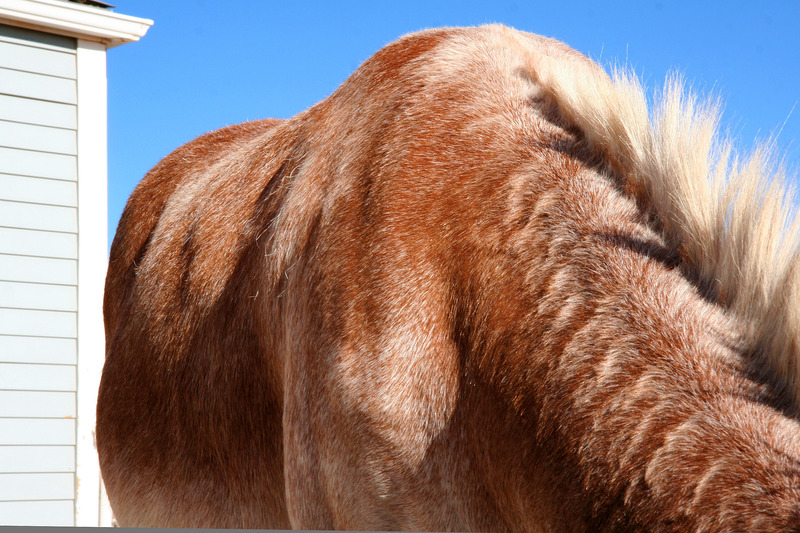 It didn’t take us long to see how miserable parasites cause donkeys to feel and what a difference proper care and regular grooming makes. Ellsworth is noticeably more at peace today than he was last fall. He doesn’t bite or scratch at himself anymore. Instead, he now often sighs deeply and contentedly. And he smiles a lot more than he used to. Good grub, nice people, no itchies — what’s not to love? Life is good! These changes…the improvement in coat, the happy sighing instead of scratching…are why I love rescued animals. I think they remember and are forever grateful. WOW, that’s a significant difference! You say what a difference proper care and regular grooming makes, but how about the love that surrounds him too. Has Carson seen him? What did she think? Of course he’s a happy boy…he’s in Shangri-La! What a sweet boy. 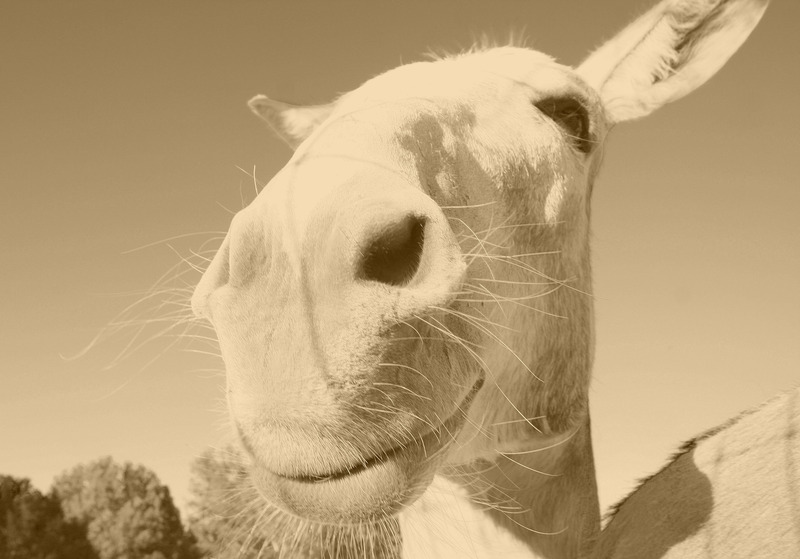 If I were a donkey I sure would want to come live with you. Ellsworth looks so good. Poor Jack needs a good brushing, but he can be very uncooperative about brushing. And just let him think you are going to put some powder of some sort on him. Back feet go to kicking high! But..he is still my baby. I may get that brush out again today so Jack can smile like Ellsworth! After living in that uncomfortable (!) situation for so long….. How wonderful to see him so healthy and happy! 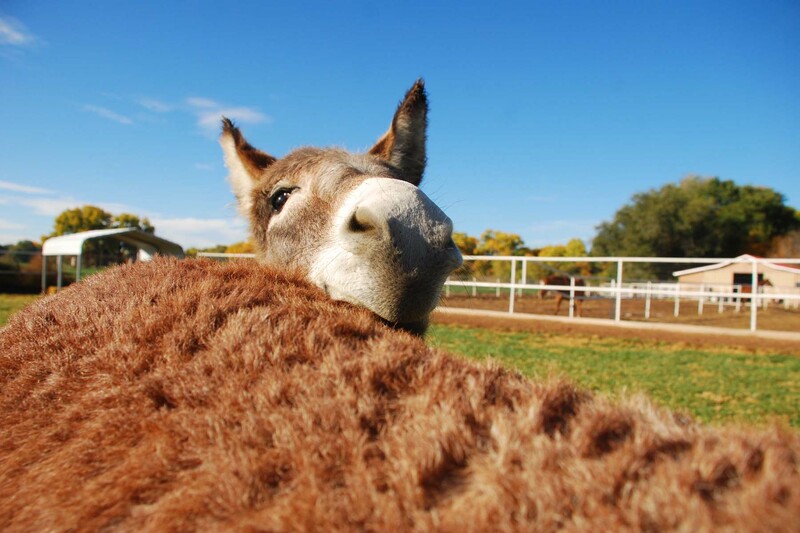 How wonderful that he can relax now and enjoy the rest of his life in burro paradise! It’s great how he sighs now. Nothing left to do but take a nap. My heart just ached for Ellsworth when I read his story. How could anyone put him through that ordeal. I am so angry at those people. Of course, his broken road led right to you, didn’t it? Give him a gigantic hug for me! Yep, this goes for rescued dogs as well. Our Handsome sighs and smiles often. I could just hug on him constantly. Their happiness shines through and through when the find a good home with good food and loving hands. I am so happy for Ellsworth – and I love his smile….Ya’ll have a done a good thing w/him, give him a hug from me…and give one to Bernard and Nigel and Fergus….hugs all around! Ellsworth, you are the poster boy for what love and care can do. See you soon. OH, look at the difference in his coat!! He is so shiny now. Happy Forever Home!! The last picture of Ellsworth smiling is one of my favorites on your blog. And I love the idea of him sighing in contentment. Now those are locks I could run my fingers through. *grin* What a blessed boy to have found a home with you guys. How deliriously happy all your critters must be. And look at his muscles, too. He looks so toned and healthy with a beautiful coat. Love his smile and I love every picture of each of them and the loving you give them. Amazing what good food, brushing and love will do. I love his red coloring. Reminds me of a beautiful red jenny I rescued several years ago ( long story), but she was at least 100 pounds underweight, hooves grown into elf shoes, nasty awful coat. Anyway, after about six months she was just beautiful. I was in love with her and wanted to keep her, but a wonderful lady came to meet another donkey up for adoption, but fell in love with my beautiful red girl. My beautiful red girl now lives the really good life. That TLC works wonders. Love that smile !